The biggest problem that people have in their strategies for motivating themselves is that they never get started. The could be because they are feeling overwhelmed by the size of the task, or just because of inertia – the tendency to keep on the way we’re going. It takes energy to change. Either way, the key is to chunk down the task into smaller steps. In fact a good way to overcome inertia is to chunk right down into steps that are so small they are ridiculous – and therefore a no-brainer to do. I had a coaching client who had got out of the habit of exercise. She loved swimming, and when she was swimming regularly she felt great – but she had just got out of the habit, and after six months she’d settled into a new equilibrium of low energy, no exercise, and eating too much. The swimming pool was on her way home from work – but she just never got round to going. So I asked her if she could pack her swimming stuff into a bag – yes she could – and put it in the car – yes she could. And next time she set off from work, could she park at the swimming pool on her way home? That was it. Was that something she could do? Yes it was. So we’d chunked down the actions so that the first step was ridiculously easy. And once she’d parked there – well, she was in the swimming pool car park, she had her swimming stuff. What else would she do but go swimming? It was the easiest thing to do. Here’s what the motivational gurus don’t tell you about motivation. They say you have to get motivated first, in order to take action. In real life, it’s the other way round. Motivation follows action. Once you’ve started, you feel more motivated to go on. So the best way to overcome overwhelm, or just inertia, is to chunk the first step down until it’s ridiculously small, and then do it. Chances are that you’ll then go on and do the next step, and the next. The time management expert Mark Forster calls this the “I’ll just get the file out” technique. If you’ve been putting off doing something unpleasant, like filling in your tax return, just get the file out with the information you’ll need to do it. That’s all – just get the file out. You’ll probably take the next step – and even if you don’t, you’ve just made it more likely that you’ll take it out again tomorrow and do something with it. I’ve used this very technique to keep on working and creating, even when times have been very hard and I don’t feel in the least like it. It works! So what have you been putting off that you can chunk down to get started? You can get some extra help with motivation from my hypnotic audio download, “Achieve Your Goals”. “A highly professional piece of work that does exactly what it says on the tin – and it supercharges the learnings from Andy’s book of the same title. 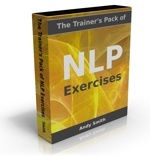 Again Andy puts it neatly and succinctly – just we NLP peeps know and others seem to miss. Great post! I like your idea of chunking down a big task into smaller pieces. Getting started on a big project is often very challenging, because you don't know where to get started. When you see all the small steps in front of you, the path becomes clear. 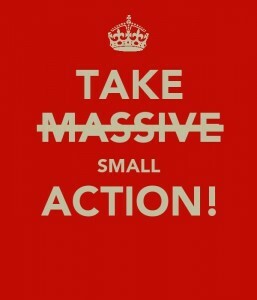 Certainly breaking down tasks into small manageable tasks not only is it likely to boost motivation but also compel action.Informative post.